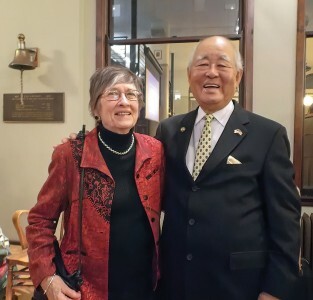 From Left: Jo Anne Chrisman Warren ’57 and Harold Arai ’57. Last December, on the 77th anniversary of the Japanese attack on Pearl Harbor in 1941, Harold Arai ’57, a Japanese-American who was interned with his family by the U.S government during World War II, gave a presentation about his experiences to an audience of 100 people at the historic Mercantile Library in downtown Cincinnati. Arai provided eye-opening detail about the context of the attack on Pearl Harbor — political, military, and legal. He showed photos of internment camps, mess halls, latrines, living quarters in horse stalls, documents families had to complete, and — at the evacuation — old men playing poker who didn’t want to leave the camp. He is pictured here with Jo Anne Chrisman Warren ’57, who invited him to speak in Cincinnati after hearing him on campus during OWU Reunion Weekend 2017. Arai is willing to travel and make this presentation to other groups.